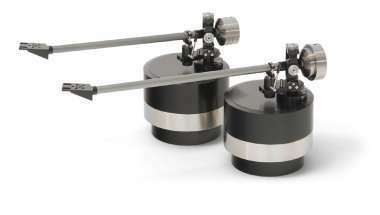 By definition, when tracking a record with a pivoted tonearm, the cantilever is aligned perfectly perpendicular to the groove in only two instances. The longer the tonearm, the smaller the offset error will be between these two instances, resulting in lower distortion. This explains why LPs tracked with the 12.1-inch long tonearm sound just a tad more poised, relaxed and natural (no rose is without thorns however: there are not that many turntables that can accommodate the »12.1« – among them our »LaGrange« and »Balance«). By the way: The »12.1« is not just a »10.5« with a longer armtube. Since a longer arm tube offers lower torsional stability and is more prone to resonances, we had to implement quite a few structural changes. We're proud of the fact that you will probably not notice any them at first sight, and even more proud of the fact that the »12.1« sounds even better than the »10.5«. The »12.1« features an infinitely variable Azimuth adjustment. A small clamping screw from under the arm tube holds the headshell in position. The headshell can be rotated by about ± 5° after untightening this screw. A precision-made plastic part mounted instead of the cartridge allows for aligning the headshell parallel to the platter or record surface. This plastic part has the same height like our EMT-ti cartridge and allows additionally for alignment of the arm height. If a cartridge has some deviation in azimuth, adjustment can be done by rotating the headshell in the desired direction to set the stylus of your cartridge vertical to the record surface.